When it comes to life-saving missions, timeliness is paramount. Not all patients require medical evacuation or repatriation via an EMA Global air ambulance. Preceding each patient transportation is an extensive assessment of the patient’s medical condition by an experienced physician on our medical panel for the best plan of execution. A stable patient that is able to sit or be stretchered may consider the more cost-effective option of flying on a commercial aircraft with EMA Global’s medical escorts instead of an EMA Global air ambulance. Our medical escorts are available to accompany patients and provide medical support anywhere in the world. Notwithstanding, a medical assessment prior to arranging the trip is conducted to determine it is safe for a patient to fly on a commercial aircraft. Once clearance for the medical assessment is given, EMA Global’s Operations team will handle the trip scheduling, purchasing seats, arranging for ground ambulance transport, as well as liaising with the airlines and receiving facilities. EMA Global’s medical escorts will accompany the patient on the board the aircraft, providing life-supportassistance as necessary, and monitoring his or her condition throughout the flight. Depending on the patient’s condition, our medical escorts comprise an Intensive-Care-Unit trained physician and nurse. Our medical escorts will also be responsible for administering medical care and medication, and assist the patient with any other medical needs. They will also assist the patient with boarding, de-planing and security clearance. After the flight, EMA Global’s medical escorts will accompany the patient to the receiving facility and provide their post-flight report to ensure a safe and smooth transition for the patient. location, a transfer on an air ambulance may be necessary. Our air ambulances are equipped with state-of-the-art avionics, allowing us to fly worldwide for repatriation services. Including Singapore, we regularly conduct and complete air ambulance flights to Europe, South America, Canada, the Middle East, and Asia. EMA GLOBAL’s specially packaged medical concierge services are designed to provide support to those seeking elective medical treatment/surgical procedures and related medical services outside of their home countries. Elective medical treatment refers to treatment and surgery that need not be performed immediately as the patient’s life is not at risk and are usually scheduled to meet both our patients’ and doctors’ convenience be it in Singapore or globally. Whether you are engaging our services or simply need an expert Fit-to-fly assessment, we are ready to oblige. Our in-house doctors are ready to perform house calls where available, to ensure you have access to medical care without leaving your residence or hotel. We are able to arrange curb-side or wing-side BLS or ALS ambulatory services staffed with paramedics or ICU-trained doctors and nurses, depending on medical requirements. You will also be provided with access to a complimentary Second Medical Opinion service, via a panel of internationally renowned specialists. Confidentiality is assured. A list of medical specialties will be made available upon request. For elective medical treatment or surgical procedures with priority appointments, EMA GLOBAL will make referrals to a panel of specially credentialled medical facilities and practitioners. Whenever you are travelling for the purpose of seeking elective medical treatment, our team is on standby to help plan your trip – flights, accommodation, visas etc. A complimentary Meet & Greet service at the arrival destination, including luggage assistance will be arranged. In addition, a complimentary limousine service will be on standby to take you to your medical facility or accommodation. EMA Global has built an extensive network of hospitals and medical facilities for placement of Letter of Guarantees. Where a medical facility is outside our network, we are able to place credit card payment on your behalf. In developing areas where cash is required, we will rely on our network of local partners to deliver payment. Through our networks of EURAMI Providers and IAG partners, we are able to place Letter of Guarantees virtually anywhere in the world. We seek to minimize costs for our clients. Our philosophy of cost containment begins from the medical transfer right through to patient discharge. We adopt a holistic, top-down approach. 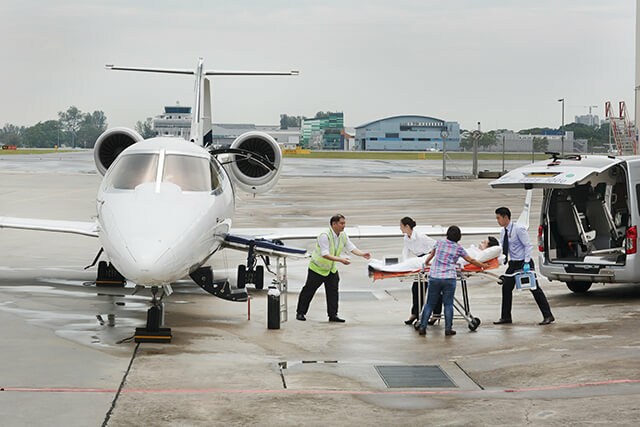 We have a strong track record of helping clients reduce costs by recommending transfers of less critical patients on commercial aircraft and Patient Transport Compartments (PTC). Insurer’s in-house medical directors trust our fit-to-fly assessments, particularly when sea-level and non-sea level flights are being deliberated. To know more about our methodology, download our Corporate Brochure(link). We routinely refer patients from assistance companies to our credentialed network of preferred medical facilities and specialist. We also issue Guarantee of Payment (GOP) on behalf of assistance companies to provide cashless services to their clients. In addition, we monitor the patient’s treatments and update the assistance companies at regular frequencies. Upon request, cost containment can also be provided.